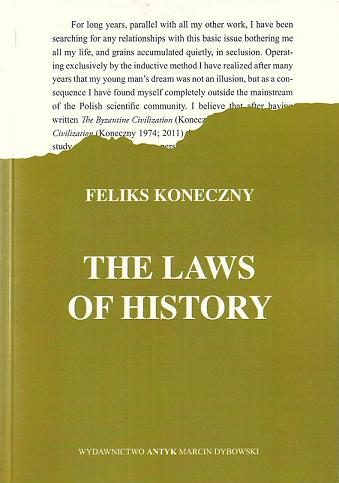 Feliks Koneczny was a Polish Catholic historian, who lived between 1862 and 1949 and spent most of his life in Kraków, Poland. Koneczny was a prolific writer, producing his most important works towards the end of his life. Since he disagreed with the Marxist claim that the class struggle is the motor of history and instead he saw the role of morality in history, he was condemned to oblivion in the communist period. In the 1970-1980s his major hitherto unpublished works appeared in Britain, to be reprinted again in Poland after the fall of communism, where they have gained some recognition among Catholic thinkers, although they are ignored by the mainstream academia. Koneczny worked out a theory of civilizations that is somewhat akin to the views of Samuel Huntington. He disagreed with cyclical theories of history that compared civilizations to biological organisms having a time of youth, growth, decline and death. Some ancient civilizations, such as the Chinese or Jewish are thriving and show no signs of senility. All attempts to view history according to a deterministic objective process deny spiritual freedom and impose an a priori vision of reality. A view of history must be a posteriori, based on facts. 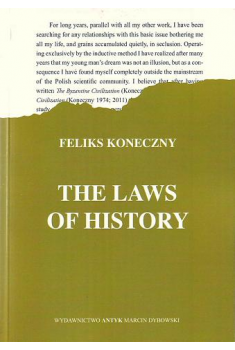 When towards the end of his life, Koneczny asked whether there is any order in history analogous to that perceived in the natural sciences, he was not searching for some objective historical course leading inevitably to progress. He was looking only for a key to interpret social reactions that appear when conflicting ethical models of life meet. Koneczny rejected the reduction of scientific enquiry to the study of phenomena or even of causes. The finality of actions, consciously formulated by responsible individuals can be studied also, because "history is governed by abstracts", the ideas that people have about what they want to do. JEWS in Poland. A documentary history.